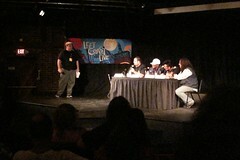 A panel discussion followed the film. The Left Coast Live music festival and conference kicked off tonight with a premiere screening of “Rock the Block: The Story of the Cactus Club” at the Theater on San Pedro Square in downtown San Jose. The film chronicles the 14-year history of The Cactus Club, the rock & roll club that was a major part of the revitalization of the South of First Area and downtown San Jose. The film chronicles how the Cactus Club was brought to South First Street as part of a city redevelopment effort to push out the strip clubs, peepshows, and adult theaters (and prostitutes and drug dealers) who dominated the area in the ’80’s; how the club provided a venue for young local musicians, up-and-coming bands, and national touring acts to play in San Jose; and how, as downtown developed the club no longer fit the high-roller, yuppie vision the city had for SoFA, leading to the clubs eventual demise when a rival club-owner bought the building housing the club and raised the rent beyond what a live rock club could support. There’s more to it than those brief highlights, of course, and if you get a chance to see this documentary, I highly recommend it. After the film, moderator and LCL organizer Chris Esparza brought filmmaker Lon Lopez on stage along with Cactus Club co-owner Stikmon, musician Lex Van Den Berghe, and Metro news columnist and San Jose nightcrawler Gary Singh for a brief, but entertaining, panel discussion. The highlight being the observation by one panelist that after using the Cactus Club to push out a red light district, the club was eventually pushed out itself in favor of higher-dollar-drawing clubs, including one that featured barely-clad women dancing around brass poles.